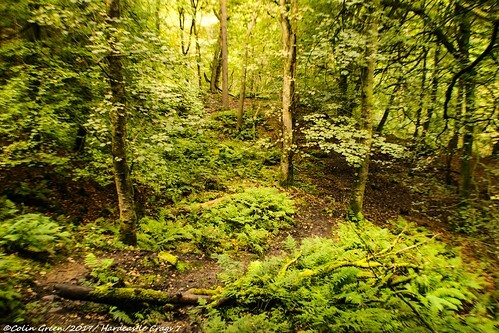 Colin Green Photography: Hardcastle Crags, Nr Hebden Bridge. Hardcastle Crags, Nr Hebden Bridge. Hardcastle Crags is wooded valley near Hebden Bridge, West Yorkshire. It is owned and managed by the National Trust and is also known as Hebden Dale. The crags are a natural valley that that is popular with hikers and families out to pass the time and has been the subject of reservoir proposals on a number of occasions that have been fought against. The Hebden Water flows along the valley bottom and passes the well known Gibson Mill on it's travel down the valley. There are currently 2 albums of pictures available to view with 12 on Flickr by clicking here or the album below, or another 14 available on Clickasnap by clicking here. The pictures were taken on the 10th September 2016 using a Nikon d3300 SLR Camera. Use the arrows to navigate the Flickr album or click to view them full size. The Clickasnap Album can be viewed by clickin here. The link opens in another window and please take the time to click and view the pictures as all views of over 10 seconds helps support my photography. Both these albums will be added to in the coming weeks and will feature pictures that are exclusive to each album. Selected images can also be purchased at Photo 4 Me. If you enjoy my pictures and blog please click below to follow me and please take a moment to share with you friends and contacts. Click here to like and follow my page on Facebook. And here to follow me on Pinterest. Click here to view "Reflections of a Mill" on Clickasnap. This is just 1 of the 14 available to view on Clickasnap. It is also available to buy from £0.50 for a download and selected framed prints are available as well for various prices. A small message about funding for my blog and photography. Below is a Paypal donate button, along with the small amount of advertising (currently my average income from advertising is £1.54 per month), and the small contributors fee I receive from Clickasnap (Currently $0.0014 per view of over 10 seconds) this is a source of income to support my photography and blog. If you enjoy my photography and would like to contribute please hit the button below and give what you can, if not then thanks for looking and please come back to view my other post's and enjoy my photographs. Click here to view "Hebden Water in the Woods" on Clickasnap. Another 1 of the 14 available on Clickasnap to view. Please just take a small amount of time to view my pictures there and help support my photography.